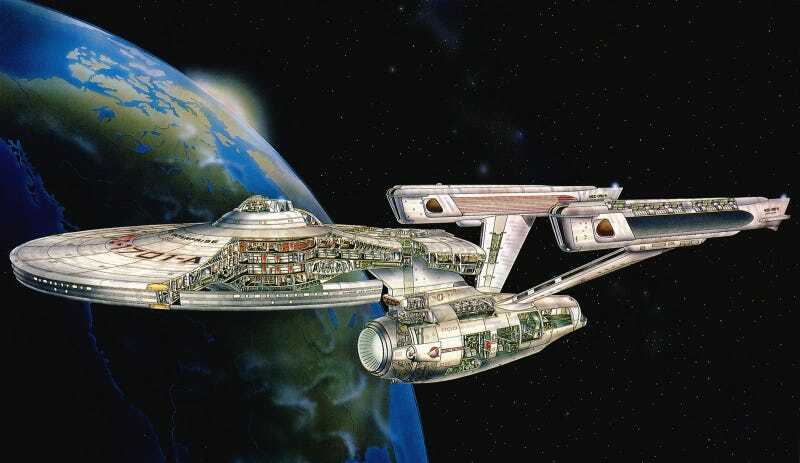 We'd all love to see a brand new Star Trek TV series, as the show warps towards its 50th anniversary. Almost everyone agrees Trek belongs on television, where thoughtful stories and optimism can flourish. But the latest rumor about a Star Trek TV show in the works? Is absolutely 100 percent false. Yesterday, Latino Review had an exclusive report that "CBS is looking to bring Star Trek back to TV." While we'd love to believe this — and it seems inevitable that one day, there will be another Star Trek TV show, there's no truth whatsoever to Latino Review's report. In a nutshell, Latino Review's report revolves around a pitch from 10 years ago for a new Trek TV show called Star Trek: Federation. We wrote about this pitch in great detail here, but in a nutshell it takes place in the far future, after the Federation has become "fat and happy," and a young Alexander Kirk may be the Federation's only hope for surviving a massive new threat. Robert Meyer Burnett, director of Free Enterprise, was involved along with writer Geoffrey Thorne, and Bryan Singer was also on board. What would William Shatner and Bryan Singer&apos;s Star Trek TV shows have been about? So Latino Review claims that CBS is eager to bring Star Trek back to television, and the same people who were involved with Star Trek: Federation 10 years ago could be spearheading this new effort. Singer is involved, and Thorne actually wrote a script for Federation which CBS could use to get the project started up quickly. And meanwhile, Robert Burnett is "rumored to be working on a non-Trek project with Skydance Productions" while serving as one of the producers of a new fan movie, Star Trek: Prelude to Axanar, which Burnett "can use as an example of how producing a reasonably-budgeted TV series set in the Star Trek Universe this day and age should be a piece of cake." Also, they speculate that Chris McQuarrie could direct. So if Axanar looks as good as everyone hopes, then "we might get a riff on Star Trek: Federation." In any case, Latino Review says, a new Trek series is on its way. All of the FEDERATION information is true...but we did that TEN YEARS AGO. The treatment was written but effectively killed when JJ took over. It never went further than the treatment...and no one ever pitched it...and I don't know if Geoffrey wrote a full script. While I have been working on AXANAR, and we are building sets, etc,...I know NOTHING about a new CBS Trek series. As for currently working on something with Skydance? NO COMMENT (but if I WERE, it is NOT related to TREK in any way). So basically, it looks like there's a mixture of true information about a 10-year-old project, justified excitement about a new unofficial movie that looks amazingly good, and complete speculation about the future of Star Trek. Oh well. Update: I've seen a number of other sites saying we didn't actually debunk Latino Review's main scoop, which is that CBS is interested in a new Trek show. It's true that if you strip away all of the stuff about Federation and Bryan Singer, you're left with one sentence of bare assertion with no context. And it's entirely possible that there are vague, ongoing conversations about a new Star Trek show, just as there probably are about every property that CBS has the rights to — but in the absence of specifics, that's not actually a story.